Please use this form to contact the Gold Dust Dancers. Someone will get back to you ASAP. Approaching Oakhurst from the south, Highway 41 to the second light in Oakhurst, there turn right onto Road 426 (Crane Valley Road), go past one light about 2 blocks, turn right onto Road 425B. (You pass Sierra Telephone and Mountain Comforts, but if you come to a second light on Road 426 you've gone too far). On 425B go about 2 blocks, turn right and go up a little hill into the Community Center parking lot. From Mariposa and points west and northwest, follow Highway 49 to Oakhurst, turn left at the light at the END of Hwy. 49, that will be Highway 41, turn right at the next light onto Road 426 and proceed as above. RV PARKING! 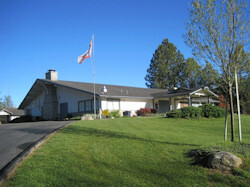 : Our Community Center Hall boasts several RV parking spaces on the grounds, that include Water and Electrical hookups, for just $10 per night.